I was planning on a complete different set of recipes for this week’s theme of US based recipes. But one look at my drafts folder convinced me that I was done with the theme before I even started. A well stocked drafts folder (magic folder) is definitely helpful ;-). Cookies are a big part of US food scene. My son loves chocolate chip cookies but my favorite is the oatmeal raisin cookies. Last year one of our friends gifted us a batch of her oatmeal cookies. It was made with whole wheat and it had coconut in them. Oatmeal with coconut was an unexpected but delicious combination. I got the recipe from her and promptly lost it when I switched phones. Finally I ended up looking online for an alternative recipe and that’s when I came across the one at Allrecipes.com. I replaced the chocolate chip in the recipe with raisins and reduced the sugar a tiny bit but didn’t make any other changes. 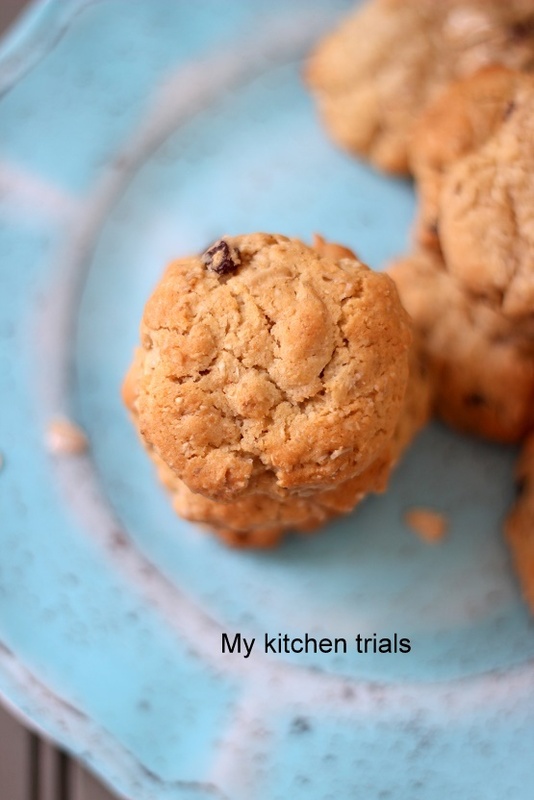 This is not a whole wheat recipe either but I prefer plain flour for treats and desserts anyway. Read on for the recipe and enjoy the treat. Bring the butter to room temperature. Beat it in a stand mixer with the two sugars until it’s soft and light. Add eggs one at a time and keep beating until well combined. Add in the vanilla extract, milk, baking soda and beat it in. Reduce the speed of the mixer and add the flour in batches. 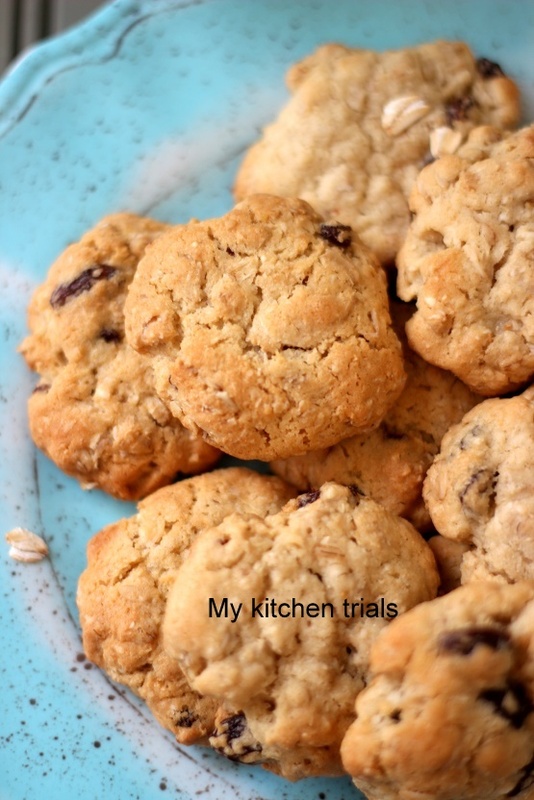 Follow it up with the oats and coconut in batches. The crushed nuts and raisins go in after that until everything is uniformly distributed. Drop Tablespoon full of dough in a parchement lined baking tray leaving space between cookies to expand. Bake at 350F for 12-15 minutes. Take off the oven and let it cool in the pan for a couple of minutes before moving to a cooling rack. Store in airtight containers once completely cool. This is so good !! Loved the recipe. Magic folders are a blessing , I have been surviving on them since the last two months . I love these oatmeal cookies , like that addition of raisins to it , though I am a chocolate person but a change is welcome . Cookies look soo good. Perfectly done. I seriously envy your magic draft Rajani..wish I had one..I am so short of recipes and not able to find enough time to cook for the blog. This cookie looks so sinful! wish I could grab some right away.. These cookies look sinful. I agree the combination of wheat flour and coconut is amazing. The cookies looks so perfectly baked just like store bought ones. Bookmarking. Love the combination of oatmeal and raisins but never used coconut. Such a flavorful cookie. 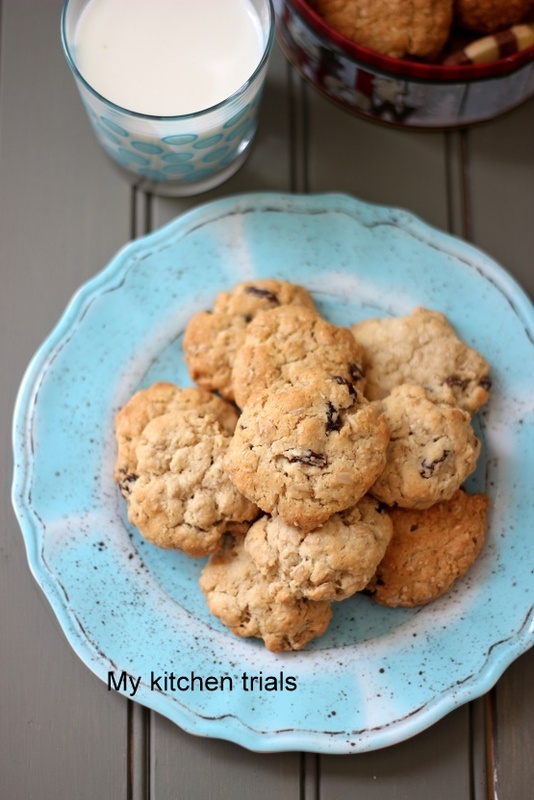 Oatmeal raisin is my favourite too….love this addition of coconut to it, have to try it asap. And I have to discover the spell for this magic folder….keeps eluding me all the time! Sinful cookies.. Bookmarking .. I wanna bake them soon..
Magic folder! How I wish I could get one. Delicious oatmeal cookies.Looks yum. Coconut, oatmeal and raisin, whatelse we need, those scrumptious cookies are seriously very delicious and super tempting. They look so perfect. Very tempting! !